As 12 boys and their football coach wait to be rescued from a submerged cave in northern Thailand, officials may be forced into action due to expected heavy rains in the coming days. The situation is grave, given a medical assessment claiming the boys and coach are too weak to attempt such a physically demanding escape. It’s monsoon season in Thailand, but cave rescuers have been blessed with a brief dry spell, making the next 24 hours all the more critical. The rains are expected to start on Friday, turning into a deluge by Sunday. Earlier today, the Chiang Rai provincial governor said the mission is now in a “race against the water,” AFP reports. Water levels have dropped appreciably over the last several days, thanks to the weather and the herculean efforts of rescue officials, who have managed to pump out 34 million gallons (128 million litres) of water from the submerged cave complex. Water levels are currently falling at a rate of 1.5 cm (0.6 inches) per hour, and rescuers can now walk through a 0.9 mile (1.5 km) stretch from the entrance to an area known as the Third Chamber, the BBC reports. 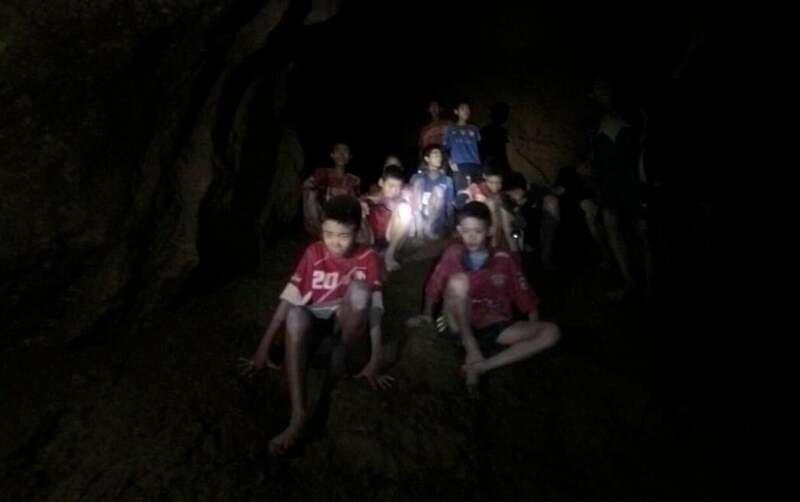 Twelve members of the youth football team, ranging in age from 11 to 16, and their 25-year-old coach, ventured deep into the Tham Luang Nang Non cave system on 23 June, but heavy rains flooded the caves, trapping them inside. 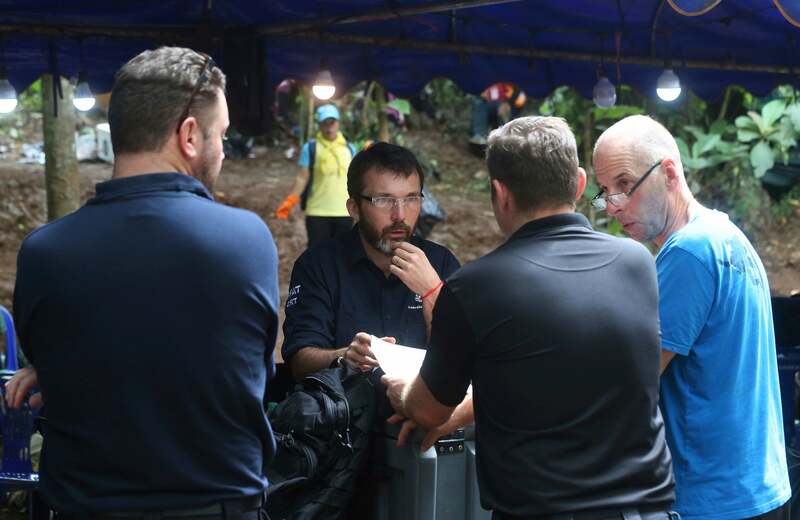 The “Wild Boar” team was discovered by expert divers nine days after they went missing, and they’re currently huddled on a steep, muddy rock some 2.5 miles (4 km) from the mouth of the cave. Medical teams are now attending to the boys, handing out food, medicine, and foil blankets, along with providing emotional care. Ideally, enough water could be pumped out from the cave such that the boys could wade through or swim out (or at least be “floated”) from the cave complex. Reducing water levels in the cave could also minimise the amount of time the boys would have to spend underwater. Most of the boys don’t know how to swim, and they have no experience with scuba diving. But given the grim weather forecast, and concerns that the space where boys are located could become inundated with water, rescuers may be forced into action. This added urgency is unfortunate. Some members of the Thai Navy SEALS, who spoke to the media without authorisation, said the plan is far too risky, CNN reports. 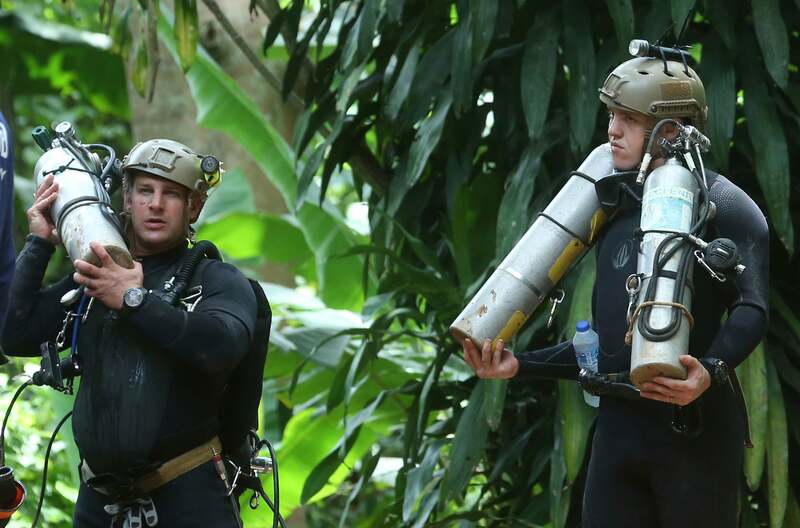 Expert divers require around six hours to reach the boys, and around five hours to get back to the entrance. There are several air pockets along the route, but there’s virtually no visibility, the water is rushing in some places, and some regions are so narrow that scuba gear has to be removed from the divers’ backs so they can squeeze through. At the same time, an updated doctor’s report claims the boys are suffering from exhaustion and malnutrition, and that they’re in no shape for such an arduous escape attempt, according to CNN. Thirteen sets of diving equipment have already been assembled should it come to that, and the boys are already being taught the rudiments of scuba diving. In addition to a helmet, wetsuit, and boots, the boys would be equipped with a full-face mask fitted specially for children. Should the boys and coach have to be evacuated in a hurry, they’d be guided through the water along a static line that’s already been installed. The boys would be led to safety by a team of expert divers who would be positioned at strategic points along the route. As officials weigh their options, other plans have been set into motion. Oxygen is now being pumped into the air pocket where the boys are huddled, and a communication line is being built to connect the team to the outside world—including to their parents. Outside of the cave, hundreds of workers, many of whom are volunteers, have assembled to help, handing out water bottles in the summer heat, preparing food, and doing whatever they can to help. Plans to drill into the rock to create new shafts have been abandoned. Instead, around 20 to 30 teams are currently scouring the mountainside in search of alternative natural entrances, called chimneys, into the cave complex. They’ve also enlisted bird-watchers, who may be able to spot birds entering or exiting hidden holes, according to AFP. The Tham Luang Nang Non cave system is normally flooded during this time of year, and it doesn’t fully drain until September or October. One extreme possibility is that the boys and their coach will have to wait it out until then. But this presents a slew of new considerations, such as the psychological well-being of the children, issues of hygiene, and the ongoing threat of further flooding.